Could you represent the stages of human consciousness with a diagram? In the late 19th century, New Zealand psychologist Benjamin Betts tried to apply mathematics to the problem of visualizing human consciousness. What he produced were striking, almost floral designs that he believed represented the shape of out consciousness for a given activity. 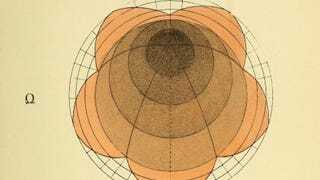 Maria Popova of Brain Pickings came across these images in the 1887 book Geometrical psychology, or, The science of representation, an abstract of the theories and diagrams of B. W. Betts, edited by Louisa Cook and available on Open Library. In his metaphysical explorations, Betts attempted to represent the successive stages of the evolution of human consciousness with symbolic mathematical forms; he was quite pleased to find that his mathematical representations frequently resulted in plant-like forms, taking this to mean that he was on the track to some universal representation of consciousness. Incidentally, he also believed that human consciousness was the only thing that we as humans could study directly since everything else must necessarily be perceived through human consciousness. While Betts methods and illustrations seem ultimately abstract, there is something appealing about his diagrams. We can almost imagine how a student of metaphysics might make perfect sense out of one state of consciousness working like a petalled bowl and another like a deep and narrowing funnel.